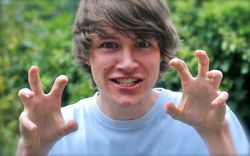 Charlie McDonnell, 20, lives in the U.K. and is one of YouTube’s most popular vloggers. Like most YouTubers, he was completely unknown when he started but slowly but surely gained legions of fans from around the world with his creative, amusing, self-deprecating and family-friendly videos. Just this week, his YouTube channel hit the the one million+ subscriber mark — an amazing achievement. He also has a website. Today, his full-time job is making YouTube videos and he is an online celebrity in his own right. Check out his latest video about going over one million subscribers.